Youth Caregivers: They need respite, too! After each live presentation, a recording of the event will be posted here. Once you have viewed the webinar, please take our quick online survey to let us know if the information was helpful. The link for each survey is found just below the viewing area. 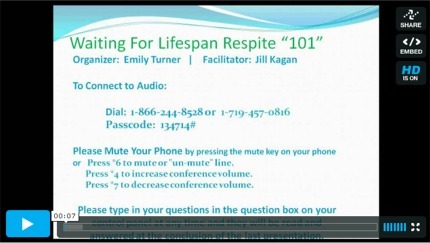 For additional teleconference descriptions, see the Lifespan Respite Grantee/Partner page. Click here. The purpose of this call was to hold a facilitated discussion (Q&A) with leaders of well-established state respite coalitions to answer questions about how to get started, vision and mission statements, coalition structure, membership, and sustainability. A similar face-to-face discussion was started at the Lifespan Respite Grantee/Partner meeting last October in Baltimore and great interest was shown in continuing the discussion. 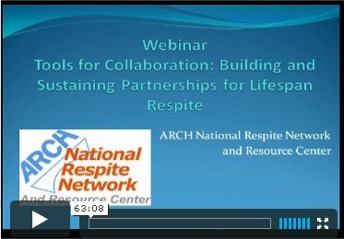 For more information see ARCH State Respite Coalitions: A Compendium of State Fact Sheets, Updated 2011, and the ARCH workbook, Building A State Respite Coalition: Where do we Begin? To play the teleconference, please click here. Please provide your feedback to this teleconference by completing this quick online survey. Thank you for your time. 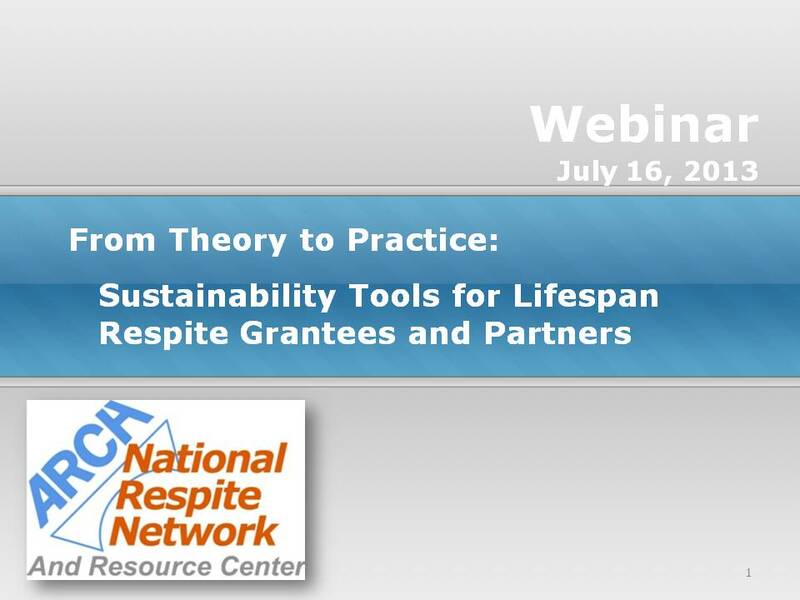 This webinar and its resources provide an introduction to Lifespan Respite, including lifespan respite legislation, the US Administration's (AoA) role in implementation, best practices in State Lifespan Respite Programs, and information to help you plan for a Lifespan Respite System in your state. To access the webinar and its associated resources click here. The shortage of respite providers continues to be a significant barrier to respite access in many communities. At the same time, government funding for social services is shrinking. Turning to the private volunteer sector for assistance makes increasing sense. The faith-based community has a long history of supporting family caregivers through respite and can offer assurances to family caregivers who are often reluctant to ask for help or mistrustful of other outside agencies. Click here. At the heart of Lifespan Respite is the concept of collaboration. Throughout the Lifespan Respite Care Act, and in the federal program guidance, references are made to collaboration and coordination among various stakeholders at the federal, state and local levels. This webinar will explore the history, successes, and challenges of collaboration among state agencies, state respite coalitions, and Aging and Disability Resource Centers. While the lessons to be learned will be most useful for those directly involved in planning and implementation of State Lifespan Respite programs and state respite coalitions, others working in social service, long-term services and supports, and health systems will benefit as well. Click here. In 2009, Dr. Dale Lund presented at the National Respite Conference in California on respite time-use suggesting that family caregivers' use of respite time was a determining factor in the extent to which the family caregiver benefits from the respite received. While Dr. Lund has been researching the benefits of respite for many years, his recent study published in the Journal of Applied Gerontology (February 28, 2011) found that employed caregivers were generally more satisfied with respite time-use than nonemployed caregivers. Dr. Lund is also a coauthor of the very thoughtful guidebook for family caregivers,Time for Living and Caring: Making Respite Services Work for You! (updated, 2014 in English & 2011 in Spanish). Presented by the Family Caregiver Alliance and the ARCH Technical Assistance Centers on Caregiving and Lifespan Respite. Successful Lifespan Respite programs build public awareness and encourage family caregivers and others to action on behalf of respite. But before you book that billboard space, write that pharmacy bag ad, or record your radio PSA, it's important to be clear on who you want to reach, what you want them to do, and why they might not already be doing it. Alicia Blater, the North Carolina Lifespan Respite Project Director, who worked for 10+ years in public relations and marketing, will walk us through the basics to prepare us to be more successful at implementing the subtleties of messaging and marketing. Alicia will talk about the benefits and barriers our target audiences may be experiencing as they see and hear messages about caregiver services, and present one possible approach to help you develop your own messages. This is especially critical for respite, which is already encumbered by misunderstandings and limited exposure among family caregivers, professionals and the public. 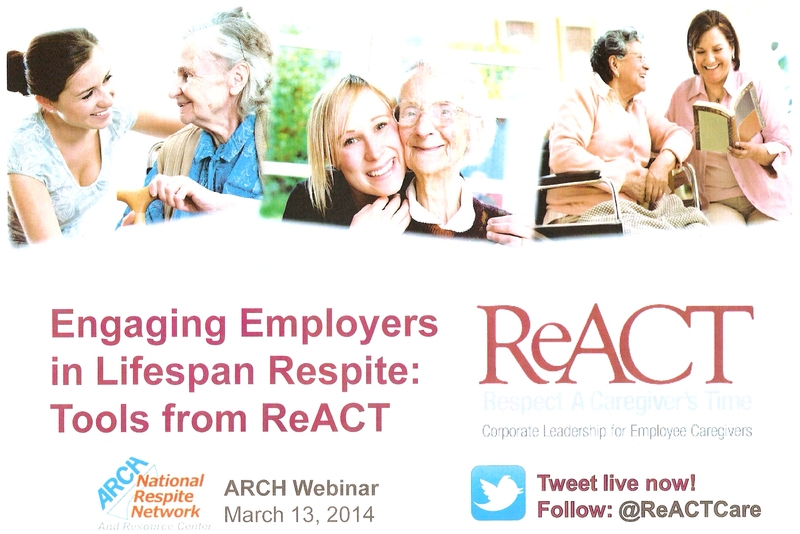 This webinar will be most useful for Lifespan Respite Grantees and their partners. Click here. As federal, state, and even private funding sources remain extremely limited, state Lifespan Respite grantees and their partners will have to work creatively to maximize and more efficiently identify and use available resources to ensure the viability of their Lifespan Respite systems once their Lifespan Respite grants are expended. Meaningful and well-established partnerships are central to this effort. 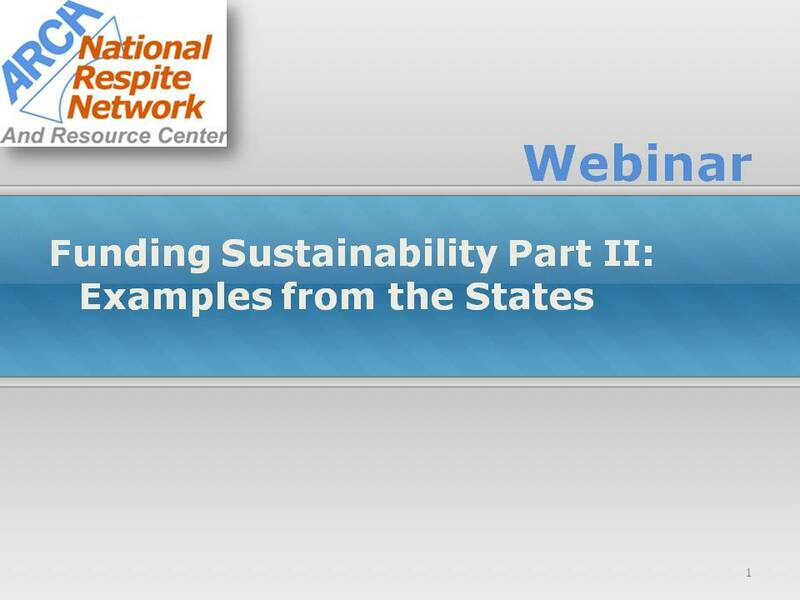 ARCH held this second webinar on Funding Sustainability on August 14, 2012. Representatives affiliated with State Lifespan Respite programs provided examples of funding sustainability plans, public and private funding sources leveraged to help families pay for respite, and ways to support the ongoing infrastructure of Lifespan Respite systems. Click here. Many State Lifespan Respite projects are engaged in the development and support of volunteer respite services for family caregivers. Concerns about the cost of doing criminal background checks for volunteers may pose a significant barrier to program implementation and respite use. In partnership with the National Association of States United for Aging and Disabilities (NASUAD), the Aging Network’s Volunteer Collaborative at n4a entered into a partnership with LexisNexis, a national provider of comprehensive background screening services, to leverage Enterprise-level services through web-based tools at a discounted rate – in some cases almost 80 percent off typical rates. All State Units on Aging have automatically been enrolled in the program, allowing them to use this service if they choose and are able. This webinar describes how Lifespan Respite grantees and their partners can also take advantage of the Volunteer Collaborative's initiative to offer background screenings at discounted rates. Click here. 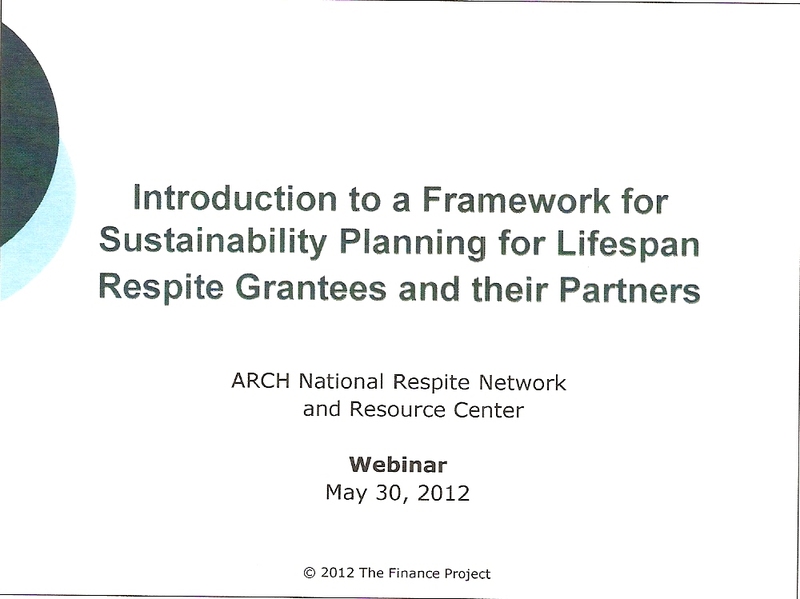 ARCH has collaborated with The Finance Project to bring a set of comprehensive tools to the Lifespan Respite grantees and their partners to help them plan for continuation of Lifespan Respite activities after federal funds have been expended. Answers questions regarding the resources and their use. 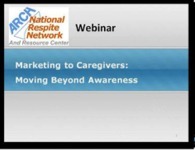 The webinar will also be useful to respite providers and community and faith-based organizations working to sustain their respite services and supports. ReACT (Respect A Caregiver's Time) is an employer-focused coalition dedicated to addressing the challenges faced by employee caregivers and reducing the impact on the companies that employ them. ReACT represents nearly 1 million employees through its membership of more than 40 companies and non-profit organizations. Melissa Gong Mitchell and Jordan Green, representatives from ReACT, shared what they learned from building the ReACT coalition and their Employer Resource Guide. These tools and resources have application for Lifespan Respite programs, state respite coalitions, respite providers and community and faith-based agencies as they seek ways to communicate and partner with employers, including small businesses, corporations and others in the private sector. From a state perspective, Sharon Johnson, Program Coordinator for the Nebraska Lifespan Respite Subsidy Program, shared plans for raising awareness among employers about family caregiver respite needs and engaging employers in their statewide respite network. Developing an approach to engaging employers in respite and caregiving supports requires knowledge of the experiences of working caregivers as well as communication savvy to deliver the most effective messages. This webinar will provide insight into both by providing 1) new national data on working family caregivers and employer responses; and 2) the experiences of an innovative partnership in New York City that is working to bring their talents and resources directly to the corporate workplace to benefit caregivers. Presenters will be Dr. Ken Matos, Senior Director of Research, Families and Work Institute, New York, NY and Gregory Johnson, Director, Community Outreach, Care for the Family Caregiver Program, Marketing and Communications, EmblemHealth, New York, NY. 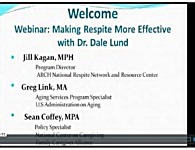 More recent Lifespan Respite Grantee and Partner Teleconference Call Recordings can be found here. 2013-2015 Teleconference Recordings: For call descriptions and additional resources, click here. Respite Rapid Roundtable - Lifespan Respite grantees and partners share accomplishments and challenges of Lifespan Respite grant implementation. Strategic Planning for Lifespan Respite: Why is it important and how is it done?